The American Hereford Association (AHA) logged another strong year of growth in fiscal year (FY) 2018. 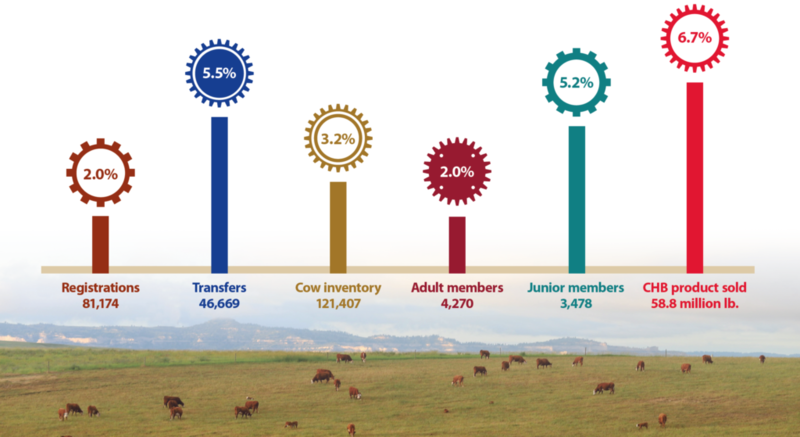 Registrations amounted to 81,174, transfers totaled 46,669 and cow inventories reached 121,407. Membership numbers also increased to a total of 7,748 members, with 4,270 adult members and 3,478 junior members. Certified Hereford Beef sold 58.8 million lb. of product. Below are a few highlights of FY 2018. The AHA released a new, robust genetic evaluation to capitalize on the Association’s 70,000 genotypes and the Whole Herd Total Performance Records (TPR) program. The new evaluation uses Biometric Open Language Tools (BOLT) software to directly incorporate genomic markers into calculations through a single-step analysis. Coupled with the use of graphic processing units (GPUs), BOLT software allows for an automated genetic evaluation that is generated weekly. Other initiatives to improve the genetic evaluation included eliminating performance data captured before 2001 and moving from an “approximation” method of accuracy calculation to a “sampling” method. Additionally, a new price structure was implemented to save members 31% in DNA testing costs. FY 2018 also debuted several new programs to improve genetic evaluations. More than 3,500 females were genotyped through the new Cow Herd Project — an initiative taken to obtain more female genotypes. The Platinum Whole Herd TPR program was developed to encourage more complete calf crop reporting and the program’s first award winners will be recognized in spring 2020. The Sustained Cow Fertility (SCF) and Dry Matter Intake (DMI) expected progeny differences (EPDs) were also incorporated into the genetic evaluation. Finally, the 19th year of the National Reference Sire Program (NRSP) tested more than 375 bulls for economically relevant traits of interest and added two new test herds — Mershon Cattle, Buckner, Mo., and Barnitz Cattle, Rolla, Mo. The AHA introduced the Maternal Advantage Program and the Premium Red Baldy Program in FY 2018. The Maternal Advantage Program takes advantage of hybrid vigor to capitalize on breeding Hereford bulls with British- or Brahman-based females. Developed in conjunction with the Red Angus Association of America (RAAA), the Premium Red Baldy Program also capitalizes on the hybrid vigor achieved through combining the strong maternal and carcass traits of both the Hereford and Red Angus breeds. Hereford bulls were also accepted in the Integrity Beef Alliance program. The AHA’s national ad campaign, “The Bald Faced Truth About Hereford Genetics,” was delivered more than 3.9 million times across digital platforms via Beef Magazine, CattleUSA, Drovers and DVAuction. Hereford Publications Inc. (HPI) created 22 ride-along catalogs and promotional inserts and 1,066 pages of ads to help members market their operations. AHA field staff reported 196 production sales with 7,060 bulls sold in total at an average of $4,930 per head. Females averaged $4,511. Hereford World was honored with the James Flanagan Award for Most Improved Publication in the 2018 Livestock Publications Council Contest. AHA’s website Hereford.org was awarded first place in the association website category. The Certified Hereford Beef Board and the AHA Board of Directors voted unanimously to upgrade the minimum marbling score on Certified Hereford Beef branded products to a USDA Choice quality grade. The modification will go into effect Jan. 1, 2019. The Hereford Youth Foundation of America (HYFA) awarded more than $173,000 scholarships in FY 2018 to members of the National Junior Hereford Association (NJHA). The Cottonwood Springs Farm Educational Endowment was established, a $250,000 endowment gifted by Tim and Nancy Keilty of Cedar, Mich. The Lot 1 Foundation Female raised $80,000 for HYFA in the 2018 Mile High Night Sale, and has generated $770,000 over its 10-year lifetime. HYFA also partnered with BioZyme Inc. for a second year to “Feed the Future,” raising more than $14,000. The VitaFerm Junior National Hereford Expo boasted 1,494 entries and awarded more than $30,000 in scholarships. Sierra Ranches, Modesto, Calif., and Pedretti Ranches, El Nido, Calif., hosted 76 NJHA members during this year’s Faces of Leadership conference.